San Diego just got lucky. Real lucky. And we will be richer for all that luck. Usually ignored in presidential primary campaigns, San Diego has been swamped this year with repeat visits by candidates. And not just because San Diego is now a “swing city” in an important state. San Diego will be remembered because the planets aligned last Thursday, during a speech that altered the momentum in the California presidential primary, and possibly for the Presidency. What started as a “military backdrop” event in San Diego, to showcase Hillary Clinton’s foreign policy credentials, instead became the “defining moment” and her own “come back kid” performance. It was widely heralded and cited as the “best speech” she has ever made. Clinton showed some spark. Some conviction. Some justifiable anger. And best of all, a stark example between the choice of a hair-trigger “nuke ‘em” response versus the considered restraint shown by the Navy Seals during the Bin Laden raid. Then the Navy Seals removed women and children from the compound, before killing the enemy combatants. Her repeated take down of Trump—in his own words, with video proof—drove the worldwide narrative for over a week. Since then, Clinton has been repeating key phrases from that San Diego delivery all over California: El Centro, Perris, Culver City, Garden Grove, Santa Ana, San Bernardino, Sylmar, Oxnard, Santa Barbara, Fresno, Oakland, Vallejo, Sacramento, Lynwood and South Los Angeles. The speech was followed by her sweep of every delegate in the Virgin Islands, and another convincing win in Puerto Rico. All together, the San Diego liftoff has left Clinton just 23 votes short of the needed 2,383 delegates to win the nomination, and provided her with some much needed momentum for California’s “big enchilada” primary. Before that speech, Clinton’s serious opponents, Bernie Sanders on the left and Donald Trump on the right, had successfully tapped into deep wells of voter rage and resentment. “Crooked Hillary” was Trump’s meme; “unqualified” and “tool of the establishment” was Sanders. Hard to counter those epithets. But, Clinton did so in that Balboa Park speech. She redefined herself, while providing a bold contrast of her restraint versus Trump’s bluster, and left Sanders without a mention. In short, the workhouse, the wonk, and the wunderkind of survival—talents long under-appreciated—came out from hiding. 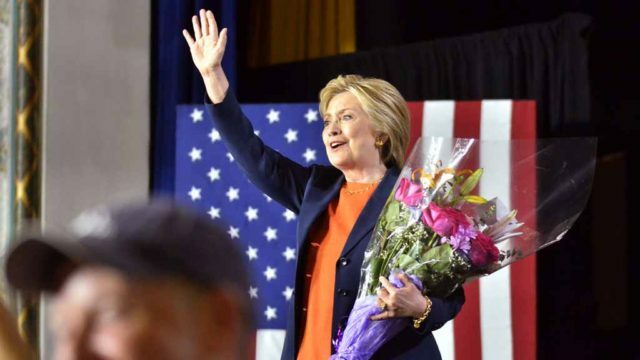 More moving than the “tearing up” in New Hampshire in 2008 (that resulted in a big unpredicted win for her), the San Diego speech showed Clinton as smart, tough and human. Clinton, however, leads by a wide margin among “likely voters” — 49 percent versus 39 percent. “[Clinton’s] standing is bolstered by the reliability of her older supporters, who have a proven record of casting ballots. “She also leads convincingly among registered Democrats; 53 percent of likely Democratic voters supported her, to 37 percent for Sanders. As always, it is “who shows up” that matters. No one really knows when it comes to California. Trust me. Regardless of who wins California, the nomination, or the Presidency, Clinton will remember that San Diego “pivot” speech fondly. That is where she began to define herself, by herself and for herself–while also illuminating San Diego’s growing importance in electoral politics. And San Diego will be the richer for it. Clinton will likely be the first woman Presidential nominee of a major party—before the sun sets Tuesday in California. Regardless, Sanders vows to fight on until the Democratic convention. Luck she found in San Diego.